1. Preheat the barbecue, griddle or grill to high. Using a vegetable peeler, cut the courgettes into long thin ribbons. Cut the peppers and cheese into 2–3cm pieces. 2. Mix the olive oil and the rub together and toss with the vegetables and cheese until evenly coated. Set aside to marinate for at least 1 hour or for up to 6 hours. Thread onto metal skewers, alternating with folded courgette ribbons. 3. Place the tomatoes on their vines on the barbecue, griddle or grill. Cook for 4 minutes until starting to blacken and burst, then remove and set aside until cool enough to handle. 4. Remove the cooked tomatoes from their vines and place in a saucepan. Add the garlic, brown sugar, vinegar and extra virgin olive oil. Cook over a medium heat for 15 minutes or until reduced and pulpy. Add the basil and blitz with a stick blender. Season and keep warm. 5. 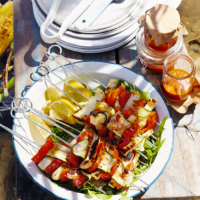 Meanwhile, place the skewers on the barbecue, griddle or grill and cook for 10–15 minutes, turning occasionally, until coloured and the vegetables are tender. Serve the skewers with small bowls of the tomato sauce to dip.